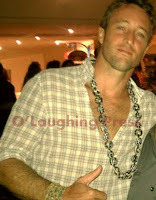 Alex O'Loughlin has found a new love. Surfing! Being born and raised in Australia, and now residing in Hawaii, the sport brings him to both roots. It's no wonder he has embraced it with such fervor. "Surfing is my great passion in Hawaii," he says. "I have a bunch of boards--all of which I ride badly." “I was actually deeply humbled by God yesterday when I went for a surf,” he says. "I learned how to surf when I got here [to Oahu for Hawaii Five 0],” says O’Loughlin. “It’s the most amazing scene here, almost life-changing." Surfing has been a cultural activity on the Hawaiian Islands since ancient times, and it represents far more to the natives than just an entertaining sport or leisure activity. Traditionally, surfing was used as a means of keeping powerful leaders in top form. Early Hawaiian surfing competitions were used to settle disputes between islanders. Constructing surfboards was also viewed as a sacred act. Probably the most famous surfer in the world, Duke Kahanamoku, resurrected the sport of surfing in Hawaii and introduced it to the world. By 1911, he was breaking world records all along the Hawaiian beaches. In 1912 Duke qualified for the Olympics, where he brought home three gold medals, two silver medals, and a bronze. He was instrumental in the development of surfing in Australia. In December of 1914, Duke gave a surfing exhibition at Freshwater Beach in Sydney. 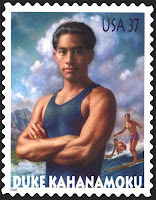 The Australians embraced surfing right away, and they hail Kahanamoku as the father of Australian surfing to this day. There is a progression in surfing. When a beginner surfer starts out, they usually ride in the whitewater until they get comfortable at paddling and performing the pop up and getting into their surf stance. Once the beginner surfer is comfortable with riding in the whitewater the next progression is moving outside and trying to ride the curl, or face of the wave. "So I'm surfing stuff that's as high as me and when a wave comes with a six foot face, I'm like oh my god okay okay. And everyone is like kook. * I love it. 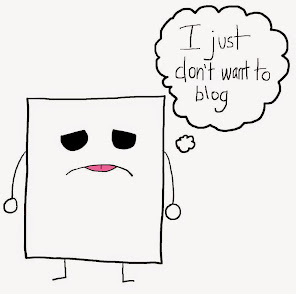 I love it," O'Loughlin said. Surfing is one of the few sports that directly utilizes the power of nature; nothing mechanical — purely natural. Surfer jewelry has similar characteristics to surfers themselves: natural, comfortable and beautiful. Since Alex might consider himself a child of nature who spends most of his time outdoors, it appears he prefers jewelry made of natural, Eco-friendly materials. It seems he has chosen the leather or cotton cord over the silver or gold bracelet. Like the tribal man on the hunt, keen on every sound and movement of the wind, the surfer's senses are wide awake to the signs of the weather, which will or will not bring the next big wave. Surfer jewelry is rich with tribal and ancient symbolism – a link to a distant past, and yet, to a new and exciting future. And Alex's future looks very exciting. Awesome post.Thanks For share this post wit us.The urge to boost our physical look with jewellery is unchanged man leather Bracelet part of our body is adorned with jewellery, be it ear rings for the ears, anklets String Bracelet ankles or neckpieces for the necks.